Do you see yourself in any of these statements? You want to share Jesus with others. You love your Synod and want its mission and ministry to be as effective as possible. You love seizing new opportunities and walking through open doors of witness and mercy as God opens them. You love seeing many, many others combine their energy and resources with yours to reach people with the Good News. You trust God with your offering, knowing He puts it to work in ways only He may fully understand, perhaps even for a holy purpose that remains unknown to human eyes, ears and hearts. For you, your gift is all about Him. Your undesignated (unrestricted) gift to the LCMS is an option to prayerfully consider, and perhaps even discuss with a representative of LCMS Mission Advancement, because of the tremendous potential it holds for accomplishing good. 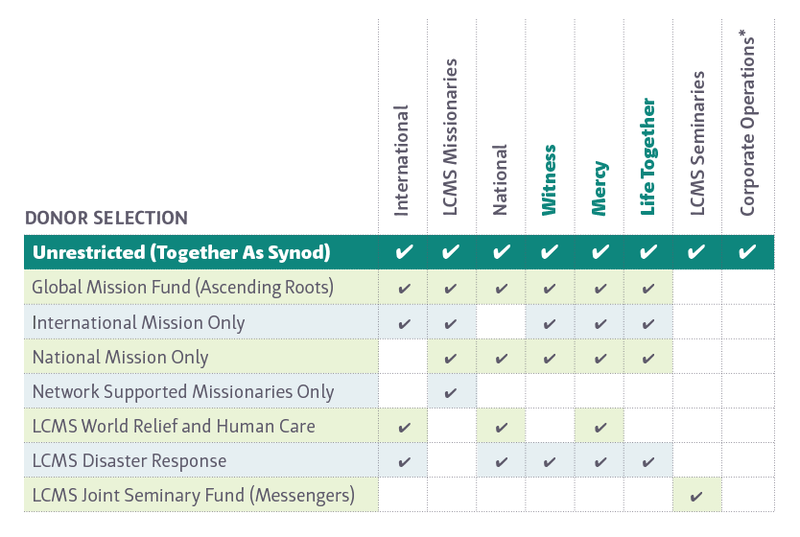 With more than 540 possible designated (donor-restricted) LCMS gift options, ranging from individual missionaries to country-specific mission and mercy work, from disaster response to life and health ministry, the world of charitable giving can sometimes appear too complex or confusing to the person who wants things to be simple, effective and efficient. Because of the way our Synod funds budgeted, high-priority mission and ministry work, the person or congregation who gives the undesignated gift is also the unsung hero for many who hear the Gospel. This type of gift flows immediately to where the mission opportunity is greatest when their gift is given, or to necessary work where donor-designated gifts are not sufficient to accomplish budgeted work. Suppose a high-priority mission or mercy project has received 50 percent of the dollars needed in donor-designated (restricted) gifts. Available undesignated (Together As Synod) gifts and offerings can quickly be allocated to initiate and complete that work — especially when time is of the essence. Without the undesignated gift, that mission or mercy effort must be postponed until all of the donor-designated funding needed is available. Each Together As Synod gift is used only to fund work authorized by the Synod’s Board of Directors in the annual budget, work that accomplishes the mission priorities set by the Synod in Convention. The use of an undesignated gift is audited annually by an independent firm. And each Together As Synod gift flows into and out of the LCMS in a way that has the lowest cost for administering the gift (compared with the other 540-plus designated gift options the LCMS offers). In fact, without the undesignated Together As Synod gift, much of the Christ-centered, Gospel-focused, mission-driven work of our Synod would not and could not happen in a timely way. With your undesignated gift, much more of that work will happen — and does happen! — because, Together as Synod, we accomplish much more when we combine our gifts than when any one individual or group tries to do work alone. To discuss in depth the tremendous value your undesignated Together As Synod contribution can have for reaching people with the Gospel, please contact LCMS Mission Advancement. We’d love to have that conversation with you. We are beginning to overtly encourage God’s people to consider giving an annual unrestricted (undesignated) donation to the LCMS. What about my Sunday worship offering? It is understandable to think that the sacrificial offerings given by God’s people in worship are funding LCMS mission and ministry. Those gifts fund the congregation’s work in its community, and most congregations even budget an annual amount for reaching people beyond their community. In days gone by, those “work at large” dollars flowed through the district office and on to Synod’s national office. What about today? Since 1980, the purchasing power of unrestricted worship offerings has declined dramatically, despite periodic increases in what the LCMS receives for national and international level work. 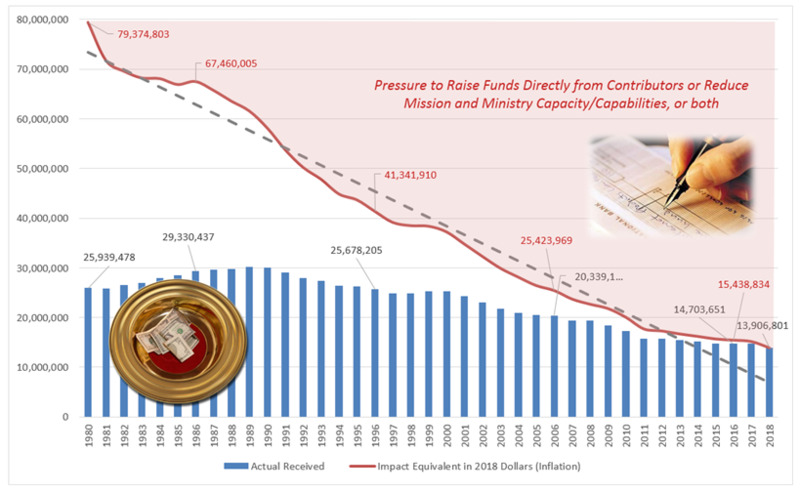 The red line is the reason the Synod’s national office has reduced levels of seminary subsidy, direct support of missionaries, and even support for the Concordia universities and colleges historically funded from worship offerings. Instead, contributions designated for these vital mission and ministry areas have taken their place. As the purchasing power of worship offerings erodes over time, pressure to seek out individuals, congregations and groups willing to give directly increases if we in the LCMS want to sustain and even grow Gospel-proclamation and Christ-centered humanitarian work. Your Together As Synod gift or bequest is a truly valuable way of responding to what sin does in the world, in effects that are even evident in something as common as inflation. For more information, or to gain answers to the questions you have about the impact of each Together As Synod gift, please contact LCMS Mission Advancement at mission.advancement@lcms.org or call 888-930-4438. As the Lord allows, please consider joining the ranks of LCMS Together As Synod donors and sharing Jesus with the entire world in Word and deeds today. Options for setting up annual pledges and automatically recurring gifts are available to reduce the volume of solicitation mail and yet show your commitment to sharing Christ Jesus with others. • Give by text: Using your smartphone, send the message STRONGTOGETHER to 41444. * Corporate synod operations includes areas such as LCMS Communications (news and information), accounting, auditing, information technologies, building operations, unfunded Synod Convention mandates, and program expenses and personnel where no other source of funding is available.